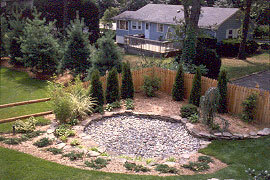 Don't let your valuable landscape investment wash away! 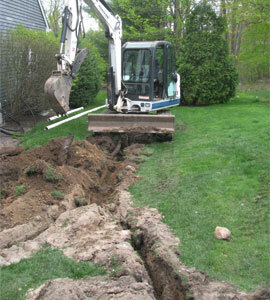 Trust Sumerian to make provisions for you property's drainage needs. Although much science goes into calculating the runoff requirements of a particular site, the frequency, intensity and duration of rainfall can be difficult to predict precisely. 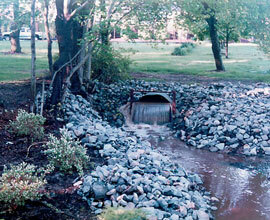 This makes experience and common sense crucial to solving drainage systems problems. lowers the high water table, which may be caused by precipitation, or ground water under artesian pressure. Subsurface drainage systems are accomplished by building a conduit below the water table, creating relief drainage and interception drainage. The collecting and disposing of excess water from buildings and property runoff. This "water" feature which is actually a huge holding area for excess water. It is constructed with decorative stone to simulate a pond complete with water loving plants but the actual water never reaches the surface. 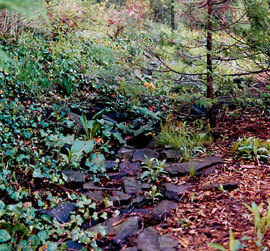 The water remains below the surface during normal weather, but after a heavy rainfall the overflow follows the natural progression of the water through the streambed. Sumerian Irrigation is proud to serve all of the Lakes Region and surrounding areas. Please contact us with any of your needs or questions about simple or advanced drainage systems.